This post adds to my summer of baby hats. (See: Elmo Inspired Baby Hat, Chappy Newsboy Caps, and Lacey Summer Baby Cap.) The Emery Beanie pattern is a free pattern on Ravelry. 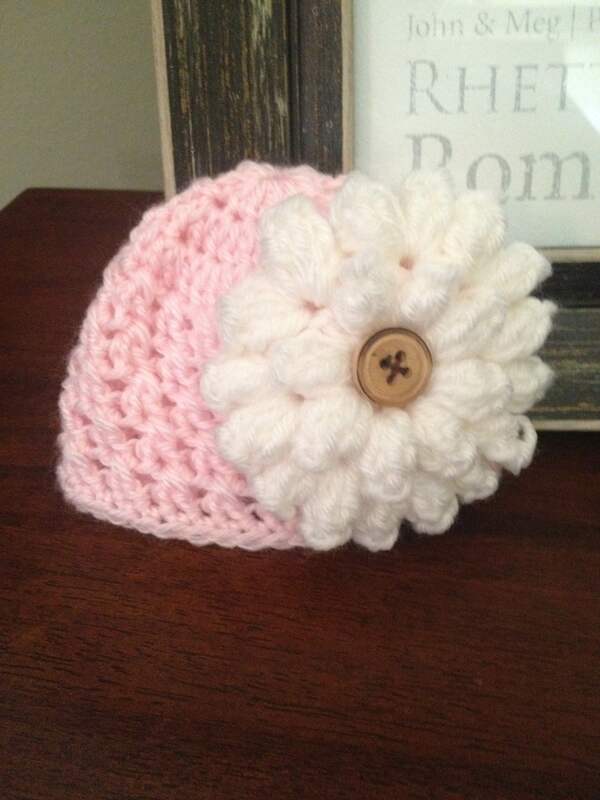 This hat crocheted up quickly with an adorable flower accent. I only increased up to 40 stitches in circumference because the hat was being made for a sweet preemie baby girl. That is really cute, I really love the flower accent! It appears that the pattern has been taken down. I don’t have access to it either. I’m sorry I can’t be any help! This pattern has been completely stripped off the internet…and I can’t find it anywhere. Do you have a copy you could share with me??? I’m sorry! I don’t have a copy. I read it off of my phone when I was making it. I looked for a copy on the internet, but couldn’t find it either.